Let me start with a confession: I’m afraid of free motion quilting and I feel lost without my walking foot! The sheer thought of having to guide the fabric sandwich all.by.myself ruins the experience and result of free motion quilting for me. The few times I dipped my toes into it, I quickly found myself back with an installed walking foot and quilting straight lines again. I decided to embrace it and have fun with straight line quilting! Well, I compiled a few different patterns from the top of my head and honestly, there are so many more. Think a bit outside the box and join me on the straight line couch. 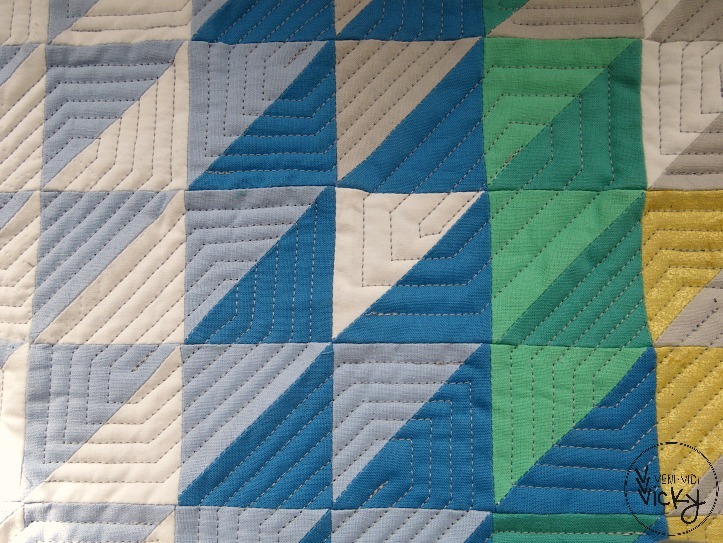 As a general rule, always start quilting in the centre. But if you want to fill a patchwork block with a spiral (as nr. 4 shows) you usually break the rule because you trace the shape from its outline and sew your spiral to the centre. Make sure to smooth out the sandwich a lot with your hands so you don’t end up with a bulk of fabric. A little tricky, but I love the look of it. 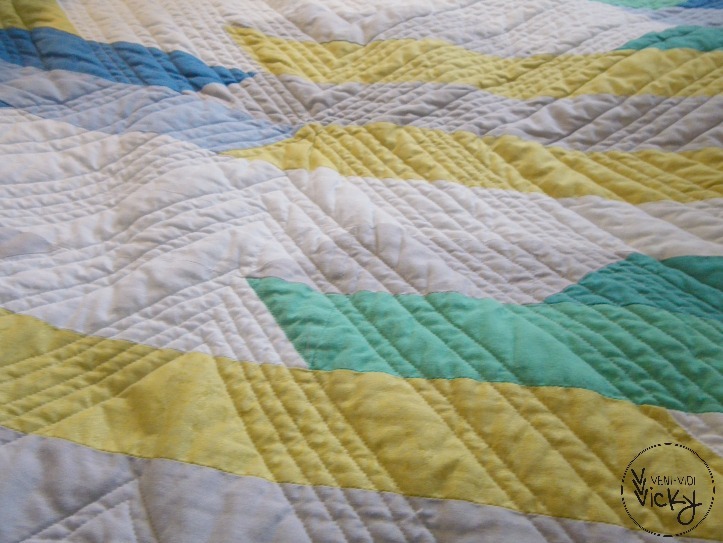 What’s your prefered way of quilting? Have you mastered free motion? Or are you too sticking to straight lines? Or do you even send them off to have a long-armer work their magic on it? 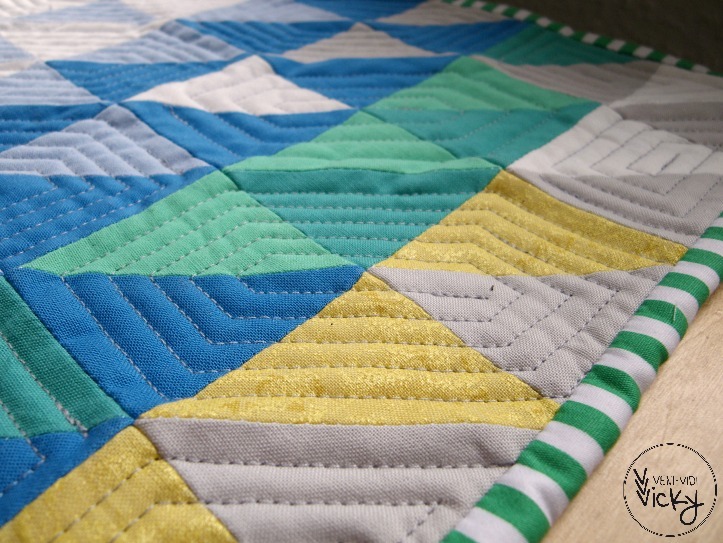 I hear you: FMQ is something I want to try, but it super-duper scares me. The flip side is that my walking foot and I have a love-hate relationship, and I never get the precise results I think that I should with simple straight lines. Of the examples you gave above, I’m most likely to attempt #5 — it most closely resembles what I’ve done on quilts and purses. As for the other ones, have you attempted them on full-size quilts (like, throw size and bigger)? I don’t know how I’d maneuver all that fabric through my machine to achieve those (awesome) results! Ooooh, I like these! I haven’t quilted anything yet so I’m planning on just going straight up and down on my first one. You have really opened my eyes to the other things I can start trying before I try FMQ, if I try FMQ, :). 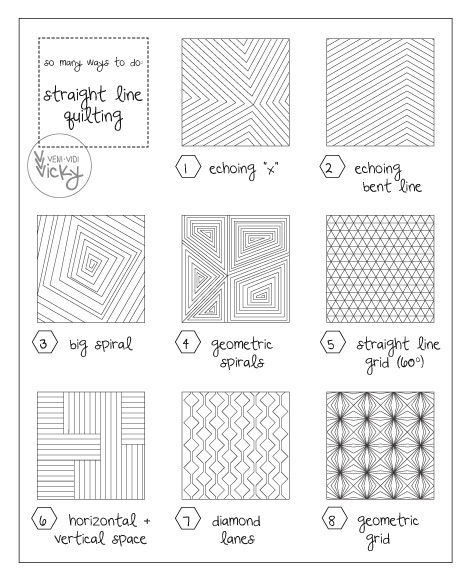 I love these and I will definitely try to think outside the box more on straight line quilting! Thank you so much. I tried freemotion quilting but only stippling but I can’t quilt everything with stipples, and I am not as confident with it as I am with my walkingfoot. Your geometric spiral is exactly what I was looking for. Do you have actual patterns for these? Hey Melissa, these are prompts to think about all the options straight line quilting offers. If you want to apply one of these, I recommend marking lines on your quilt top with a disappearing pen before basting. So inspiring!! I’m going to encourage my hesitant machine quilting friends in my charity quilting group to check out your ideas!! Thanks for the inspiration!